BELCO crews will be working on overhead lines on Rural Hill in Paget between 9:30am and 3:30pm on Thursday [Sept 13], and traffic controls will be in place, the company advised today. 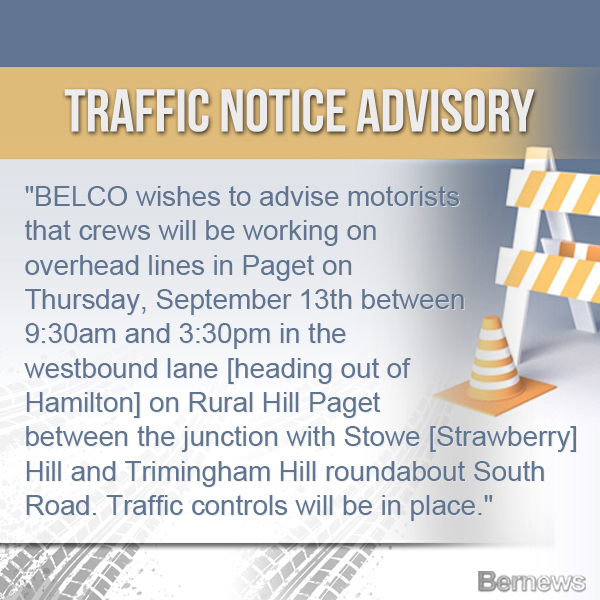 A spokesperson said, “BELCO wishes to advise motorists that crews will be working on overhead lines in Paget on Thursday, September 13th between 9:30am and 3:30pm in the westbound lane [heading out of Hamilton] on Rural Hill Paget between the junction with Stowe [Strawberry] Hill and Trimingham Hill roundabout South Road. “Traffic controls will be in place,” a spokesperson said. “Motorists are advised to approach with caution while work is ongoing and when possible to use alternative routes.